Hi everyone. First post as I just signed up after buying an RX8 a few hours ago which is getting delivered this afternoon (Wednesday). I live in Teesside in the NE of England and have bought an 09 plate RX8 R3 with 15k miles and even though I have only had a short test drive I had to buy it!!. Anyone got any 'must know' information for a 100% noob to the RX8?. I've read about using dexelia oil but that's is only info I know. the r3 is an awesome car and you will enjoy every bit of it. feel free to trawl on the s2 section here and find a wealth of information relating to the r3, this forum has the most up to date information regarding the s2. plenty of reading for you to gain knowledge and information. Hey Guys/Gals another R3 owner here. Definately up for a group meeting. Hi guys Hope I can help out some of you in the south. Got my first RX8 a couple of weeks ago. Nice red 192 with the cloth seats (dislike leather - tend to slide around on it). Traded up from an MG ZR and blimey - does that thing shift. Very comfortable too! I'm Will66, somewhat notorious amongst RX8 owners in the UK unfortunately. Looking to gain some knowledge around here! Hi Will! Can't believe you've only just joined here! HELLOOOOOOOO PEOPLE! 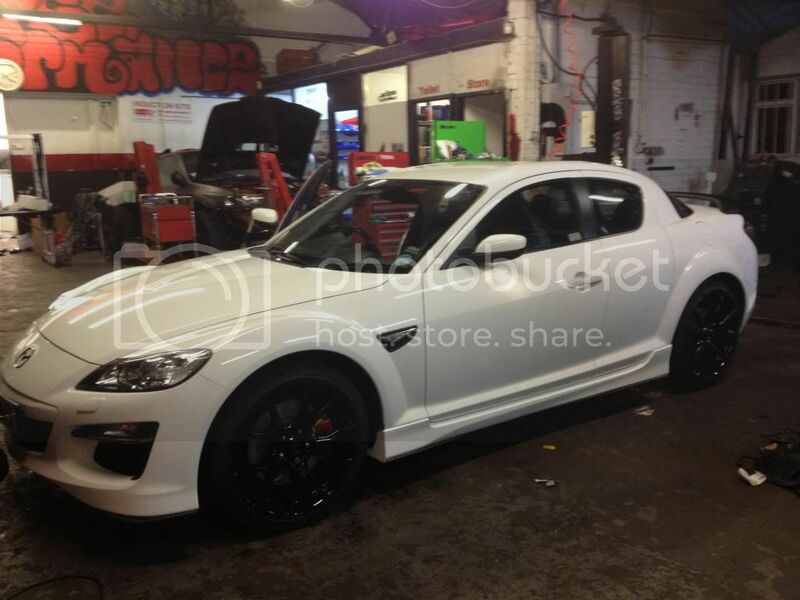 55 plate black RX8 with black rims in Birmingham =D I love this car! Anyone know of any good places to go racing/drifting around UK somewhere??? Any meets been organised anytime soon? Location: Quarry Bank, W Midlands, England. Hello folks, got my 54 plate silver 190 RX-8 last Thursday. I live in Quarry Bank, West Midlands. I'm new in RX-8 comunity, in France, and I'm looking an internet shop where we can buy mazda parts (or copies) for a decent price. Until now, I find only websites located in USA. so very expensive with shipping cost and taxes. Do you have any recomendation for europe? New to the club and website. Bought my 192 '03 RX8 last week, already had to do the rear light and sun visor fix - thanks for the DIYs on here - really ver useful! Hello Guys, I am a new proud owner of 2004 RX8(manual) from Colchester,Essex. Can't wait to expand my knowledge about RX8. Anyone around North Wales area then? Also, if anyone knows of someone selling an Aero Front Lip as I can't find one anywhere (unless I pay mental cash), then feel free to PM me. Well, mod wise, I've already put 20mm spacer on, replaced the standard front and rear discs with Cross Drilled and Grooved... just ordered the wheel spash protectors in Copper colour and the Aero side skirts, just can't find a front splitter for it though... Will chuck some photo's up soon. Hi I am from down south east,04 plate for over a year.lovely fast car. Good luck, there's no such thing as a straight bolt on kit.